Cloud Computing is now ruling the IT world, Hybrid Cloud is the most optimal one and the preferred one for Larger Enterprises and I have wrote more posts on this earlier when I start researching on this topic and you can check my Cloud Computing Section to review the posts shared earlier which will give you some insight on the topic. Microsoft team is now concentrating on providing enhanced service to the customers with their new moto "Mobile First, Cloud First" and transformed the current IT industry to the next level and still continue to innovate more on both ends of the Market, This post is written here to share about the upcoming webinar from Microsoft Cloud Team on Hybrid Cloud scheduled on Thursday, April 17th, 2014 from 10:00 A.M. – 11:00 A.M. PDT. and this is the first webinar in series and we can expect more episodes in the upcoming days. 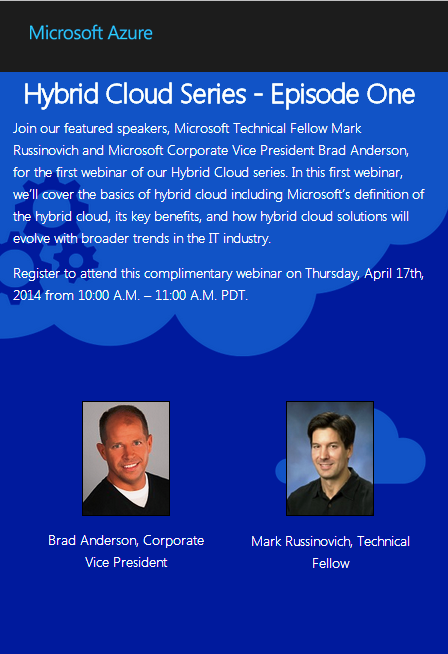 This Webinar is a quite a informative one and must attended one as we are getting chance to listen on Hybrid Cloud concepts directly from the key people Microsoft Technical Fellow Mark Russinovich and Microsoft Corporate Vice President Brad Anderson leading their Cloud business. *This great session completed successfully sharing great information on the new innovation and the future of Microsoft Cloud Computing and its now available on demand for registered users, Also you can get to know what was discussed on the Webinar in a nutshell with the help of the below excellent Redmond Magazine post below.